How Being Vegetarian Changed My Life – Lovely.Multifaceted.Chic. Back in 2013, I adopted a vegetarian lifestyle for a about five months. I never intended to become a vegetarian, it sort of happened as a result of fasting for a few weeks of eating only fruits and veggies. 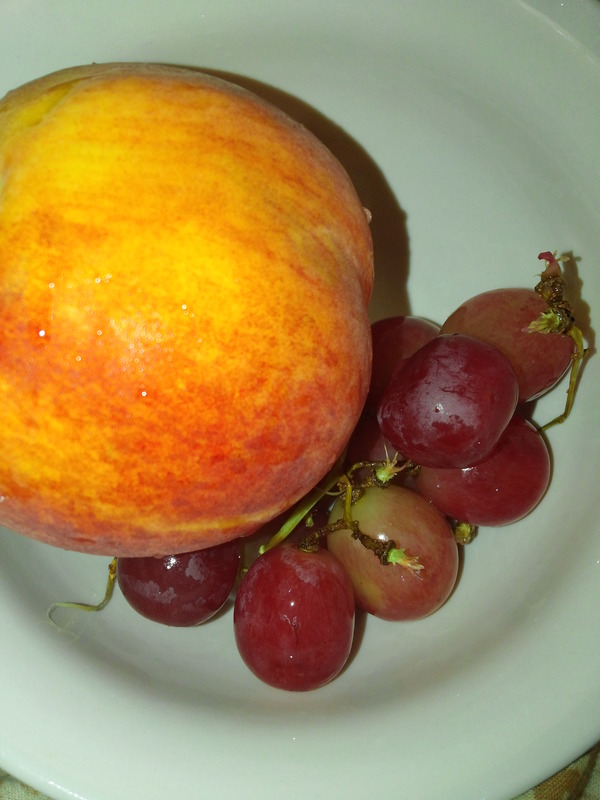 I really enjoyed eating fruits and veggies and I liked how my body and spirit responded to the change. 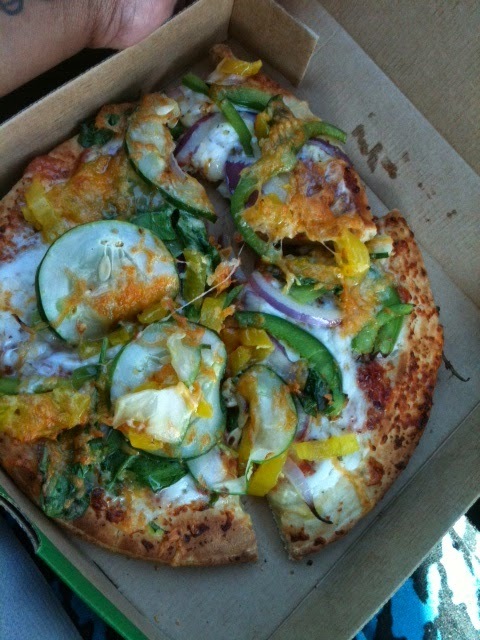 Even after I incorporated meat back into my diet last year, my life was changed due to my vegetarian experience. I wanted to share how being vegetarian has changed my life. Before I begin, I have decided to go back vegetarian because I function best eating that particular way. I will be transitioning to this lifestyle. So here I go. I have learned how to be creative with meals and snacks. Smoothies have been a go to options for me since my schedule can be full and hectic. I normally freeze fresh fruits or buy frozen fruits. I started adding veggies to my smoothies as well. 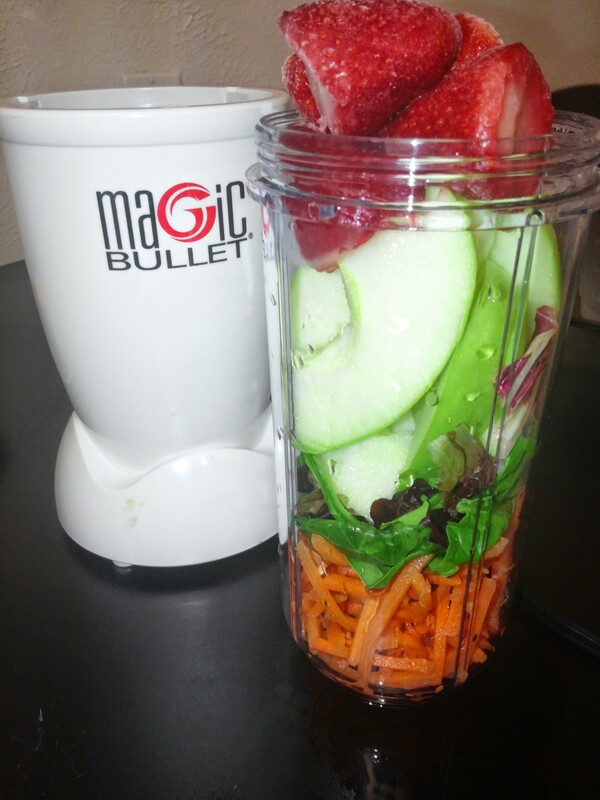 I purchased a Magic Bullet to make my smoothies. I also like mixing fruit. Strawberries are my favorite. 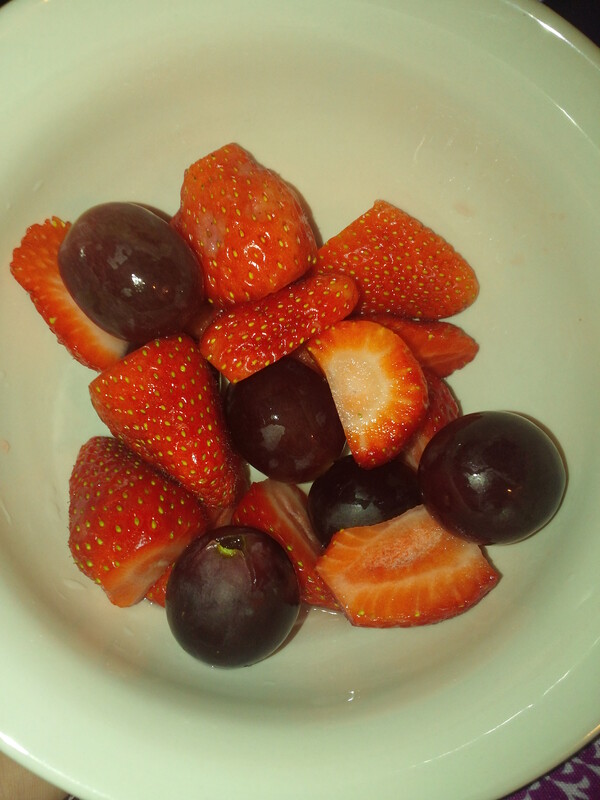 I like eating fruits for late night snacks. 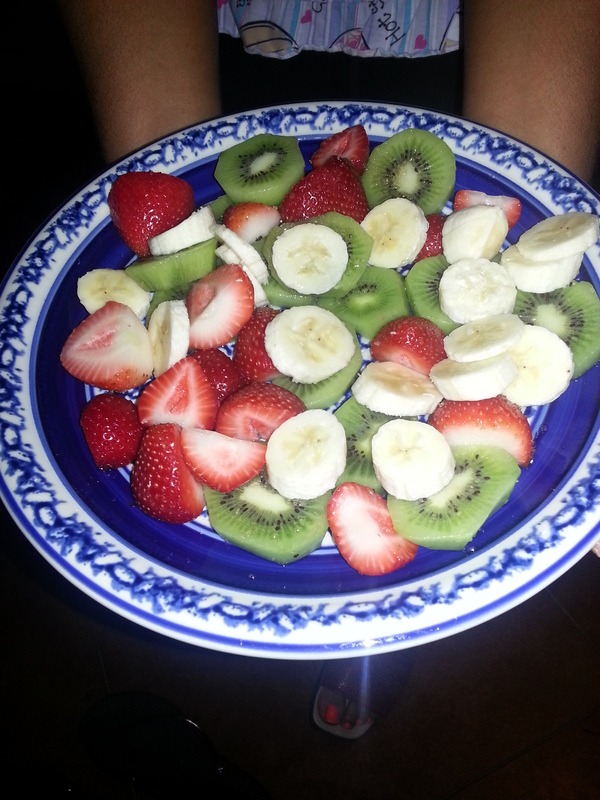 Here one my favorites-strawberries, kiwis, and bananas. 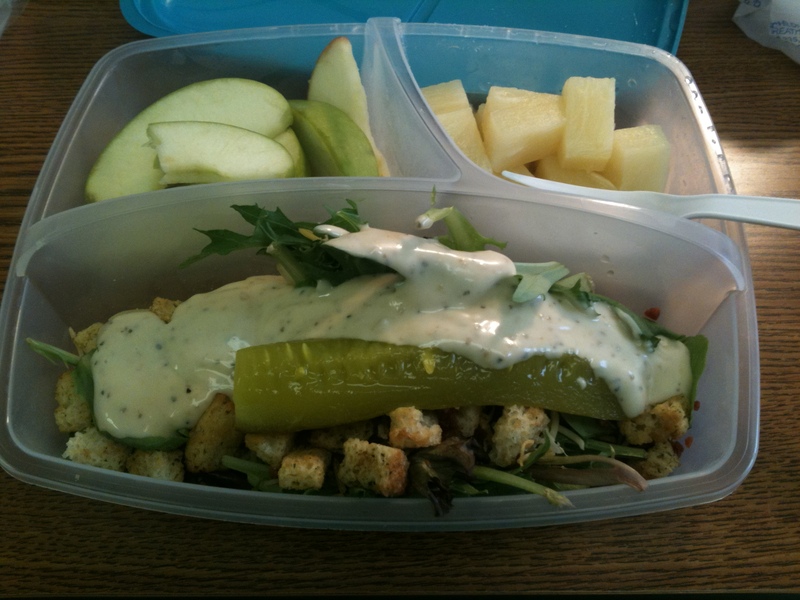 Here are some lunch options I used when I first went vegetarian. 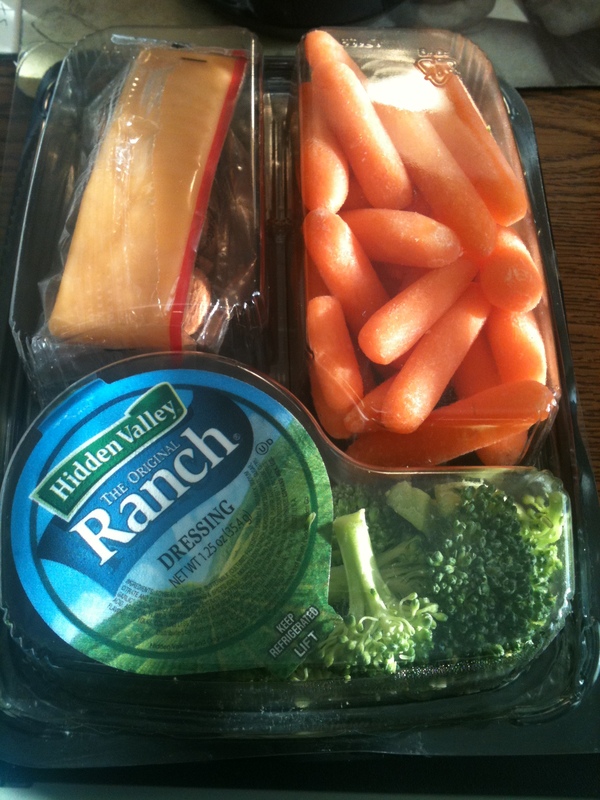 I got different variations of these veggies trays for lunch and snacks from Wal-Mart for $1.97. They also have fruit trays similar to this. I began to be more proactive about researching foods that are not good for my asthma. I learned a lot through trial and error. I discovered that dairy is not the best for asthma and allergy sufferers. 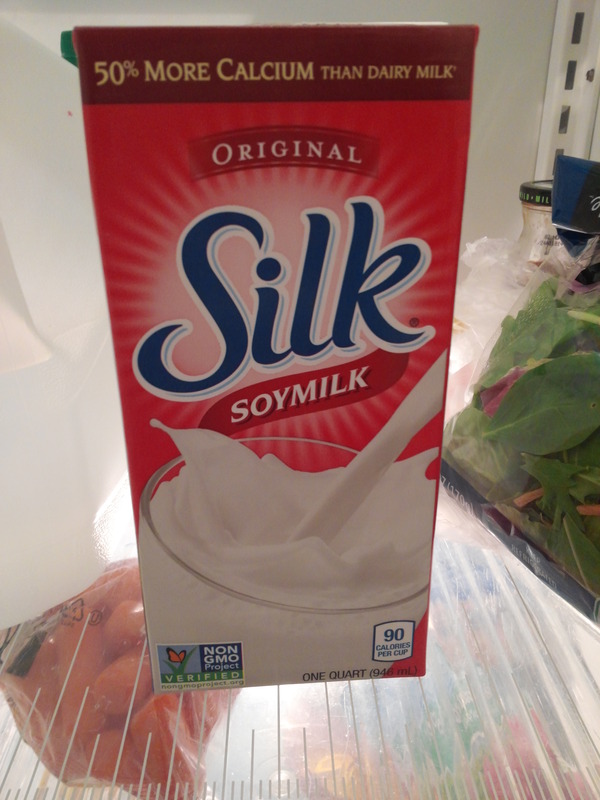 I started using soy milk because I like milk and it’s diary free. It’s been almost two years. 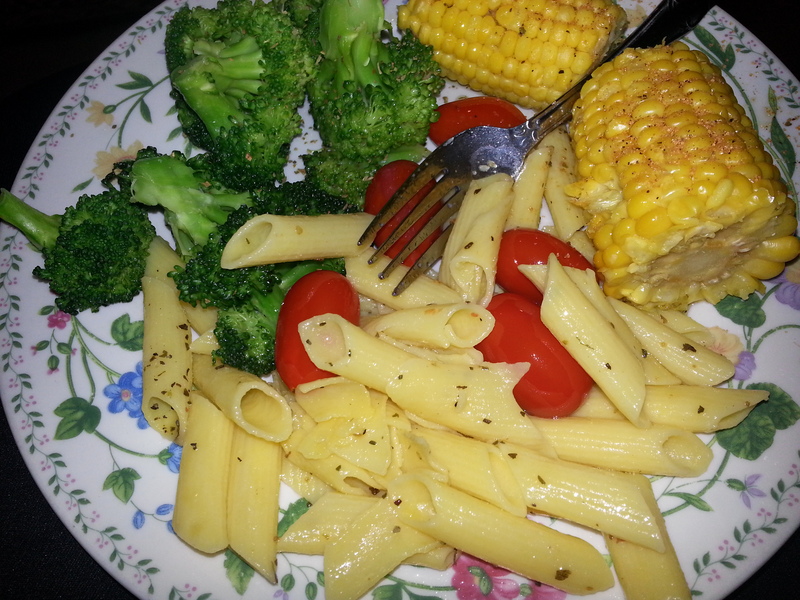 I use different vegetable oils instead of butter. I’m not 100% dairy free because I may use cheese occasionally for salads or when I go out to eat. I also found out that gluten sensitivity is common for individuals with asthma. I realize that I am gluten sensitive. After I took gluten out of my diet I noticed big change with my digestion. I buy gluten-free pasta, cereals, and other products. I found gluten-free cake mix. 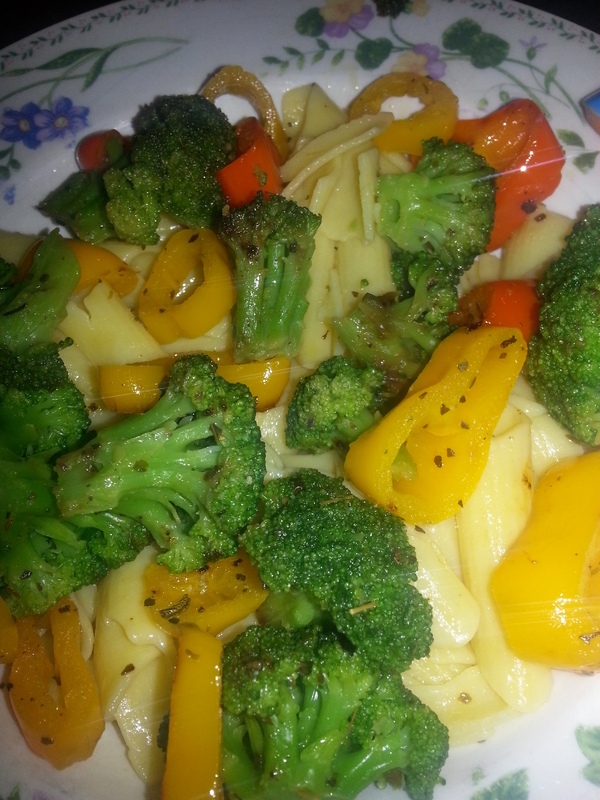 Gluten-free pasta mixed with fresh broccoli and peppers. I found new, healthier ways to cook my favorite dishes without meat. I like flavorful dishes. I like cooking spaghetti. I started adding mushrooms and spinach instead of meat to my spaghetti. I also use gluten-free noodles. I’m a southern girl and I like soul food. I liked greens. Normally, greens are cooked with pork for seasoning. I found a recipe that uses fresh garlic, onions, and other spices that taste amazing. I tested the recipes with my family and they love it. My mom loves these recipes. I like making homemade vegetable soups with mushrooms instead of meat. 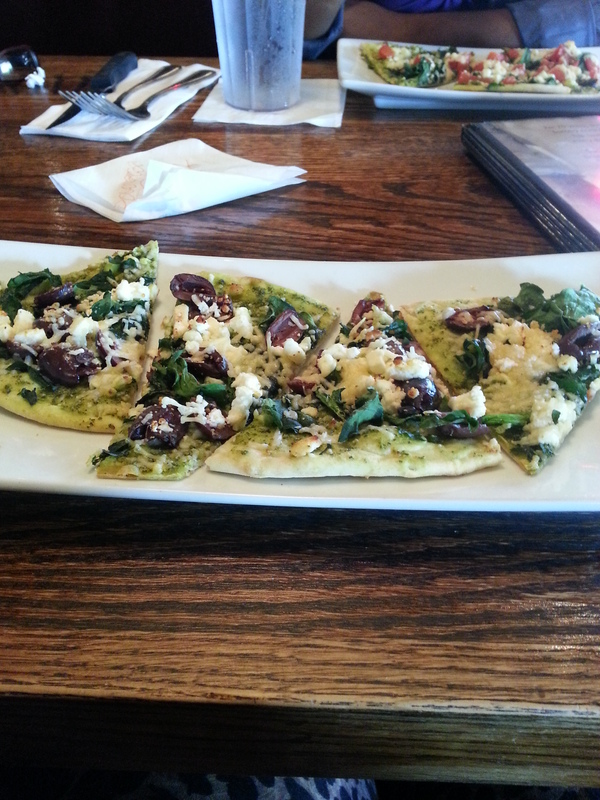 Going vegetarian opened my eyes to trying out vegetarian/vegan restaurants and new dishes when I go out to eat. Some dishes are not good and some are not so good. I was at R. Thomas Deluxe Grill in Atlanta, GA trying an organic smoothie. I learned that even if you are not vegetarian you can incorporate the diet into your eating routine. For example, I would eat strictly vegan for a week or two to reset my system. Also, you can go meatless for a day or for a meal. Being vegetarian helped me to be more discipline this is why I am choosing to eat this way. I just wanted to share my experience. I will also be sharing my experiences from here on out as I learn and grown in my nutrition. Talk to you soon! 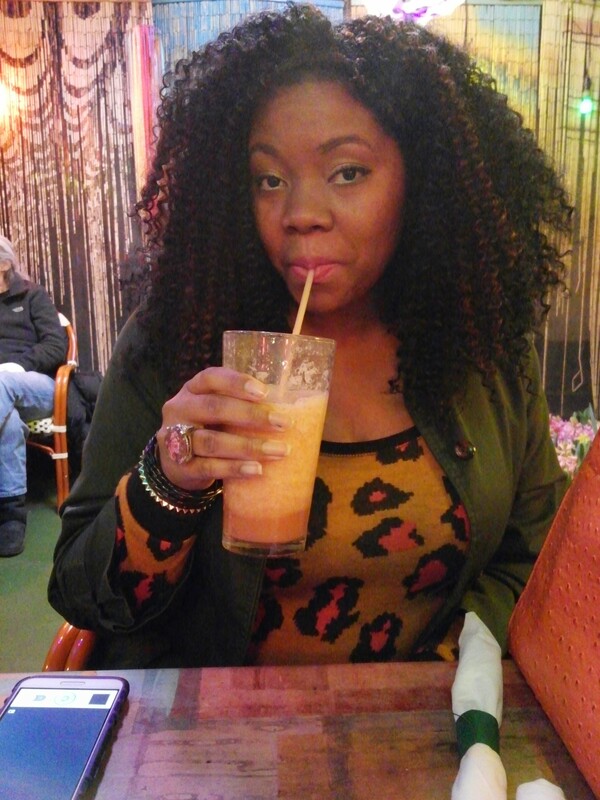 Vegetarian Update…Transitioning and Taking My Time | Lovely.Multifaceted.Chic. My doctor recommended that I go soy, gluten, sugar and dairy free. I find it really difficult when I am cooking for a family that eats “whatever”, then I get very frustrated with myself for falling back into habits that I know don’t serve me. I love your beautiful food! Keep posting and giving me inspiration! Thanks! I feel you…it is not easy. I try not to stress myself out too much if I don’t get everything just right. That’s why I won’t commit to being vegan. I definitely want to improve what I eat. I’m taking baby steps.